It’s all here in Connecticut! As the first full week of March began, we were greeted with a snowstorm! 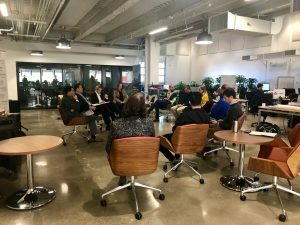 While many of our startups are excited to see true Connecticut snow, many of our partner meetings and training sessions were canceled. While that normally would damper some spirits, having a day off from our normal crazy schedule was welcomed. It allowed the startups and our team (after shoveling their way out) a day to catch up on some necessary work. These snowy days make us countdown the days until spring arrives. When the weather warmed up on Friday (typical New England weather) we took our startups to The Wadsworth Atheneum Museum of Art. The Wadsworth Museum was founded in 1842 and is the oldest continually-operating public art museum in the United States. The startups had a chance to browse over 50,000 works of art that span over 5,000 years. As temporary Hartford residents, they all signed up for the Wadsworth Welcome pass, which gives them free admission. We expect them to visit Hartford’s hidden gem soon. In the spirit of creativity, UX/UI was covered this week during one of our training sessions. 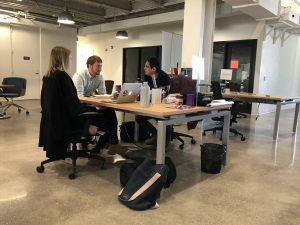 New Haven-based company Checkmate stopped by to help our startups out. Checkmate ran through the different values of design (time, money and emotion) and how critical these values are to each company’s value proposition. After determining appropriate values, Checkmate coached a design ‘sprint’ and encouraged the startups to use it in all aspects of their business. Huge thank you to Cigna for stopping by and being the first partner to visit the startups. Cigna answered all the questions in regards to what to expect during a proof of concept, which helped the startups immensely. Understanding the process, paperwork and timing was extremely informative and helpful. The startups, geared with new knowledge, are looking forward to productive proof of concepts. We also managed to sneak in a little fun with Cigna. 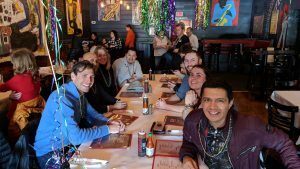 They stopped by on Mardi Gras and we couldn’t help but indulge in some southern comfort food at Black Eyed Sally’s! Did You Know: Cigna has been in business for 225+ years?! The Hartford team arrived for their partner meetings on Wednesday. 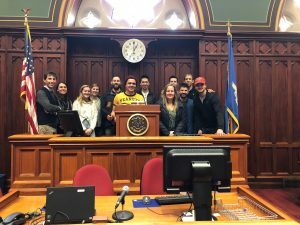 The Hartford brought a diverse team with them, representing many departments to include a few individuals that were new to the Hartford InsurTech Hub process. It was a joy to see them mingling and meeting with the startups. Did You Know: In 1810, The Harford was established as a fire insurance company, and they even employed their own fire department to protect their customers, and later on Abraham Lincoln purchased a policy through The Harford. ABCT showcased many bioscience projects at their roundtable at Shipman Goodwin in Hartford. SEMC4, one of the largest clinical genomics laboratories in the world, recently selected Connecticut as their lab location and gave an inspiring presentation on their decision process. We wish their bioscience companies good luck as they are heading to their demo day on April 10th in NYC. Did You Know: Connecticut ranks 4th in the nation for bioscience patents per 1000 people. On our visit to the state capital on Friday, we all had the privilege to sit on the chair made from the Charter Oak Tree. The story of the Charter Oak Tree, and the importance of the hidden document, was pivotal for Connecticut’s history. It was a perfect representation of why having all the proper documentation in a safe location is important for our startups. 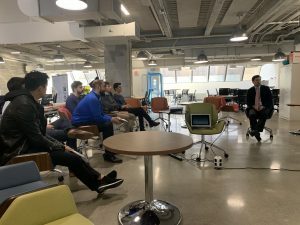 Our startups even received advice from some of our legal partners this week, and these partners encouraged our startups to have their affairs in order. Did You Know: The senate chair was carved from the charter oak tree which fell in a hurricane in 1856, they even held a funeral for the tree. We were fortunate to have many local legal resources stop by and help our startups create the future they envision. Clyde & Co, whose expertise is in insurance law, took the time to understand each company and answered a variety of insurance legal related questions. Their knowledge and understanding of new issues and insurance gave them a unique viewpoint to answer all questions. Gerry De Pardo delivered a session on Patents, Trademarks™ and Intellectual property. 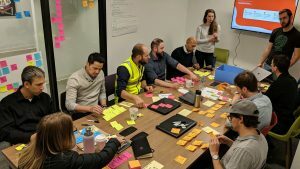 The timeframe needed to start the process was something that had the startups thinking about how to approach this process. Using products and logos that we all know and recognize, Gerry made the legalese simple and entertaining. Ben Wiles from UKS led an in-depth discussion on convertible notes. 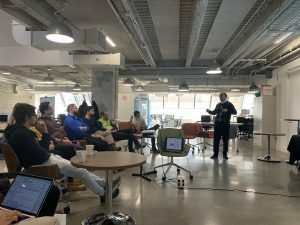 The way he created the slides, issues to watch out for, and alternative ways in which to structure fundraising contained some new information for many startups especially compared to what they have seen outside the US. During our tour of the state capital, we had a chance to see the bronze statue, Genius. 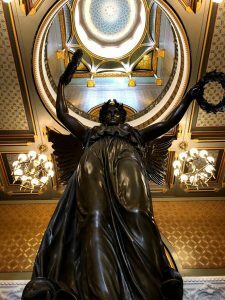 Genius once stood at the top of the gold dome of the state capital, and after being toppled off during a chaotic hurricane, she was re-casted in bronze and now sits inside the capitol. She is a symbol of female leadership, and it was great that we got to visit her on International Women’s Day. Did You Know: the dome of the capital where the Genius once stood is made from 23-carat gold? 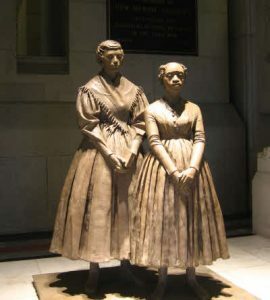 On the topic of powerful women in Connecticut, we also had a chance to see the Prudence Crandall statue. Prudence opened an academy in Canterbury CT in 1831 to educate girls. She admitted Sarah Harris, a 20-year-old African-American woman who wanted the education to become a teacher herself one day. Harris’ admittance to the led to threats, trials, and attacks. While she was forced to close the school and leave the state, her student Sarah Harris continued on to be a teacher. This is a wonderful example from 1831 of women raising other women to greatness. On International Women’s Day we give a big thanks to all our women partners, women-led startups, and mentors. They are innovative, dedicated, future-focused and extremely giving to their community. We are fortunate to have so many amazing women supporting Hartford InsurTech Hub. Next time someone asks you about Connecticut, remember the four seasons, creativity, strong insurance history, the charter oak story and best of all, our strong talented women!